PHILA PA -- This week the Philadelphia Phoenix will enjoy their first BYE after 9 straight weeks of AUDL competition, taking some much needed time for rest and reflection. With the respite we also can’t help but look ahead to the final stretch of the Phoenix season and the tangled race for playoffs the AUDL East has created. For the first time this season the Phoenix played a home game with weather that could be described as anything close to pleasant. Opening pull saw 70 degrees and a slight breeze, launching the Battle of the Birds with what many would consider “perfect ultimate weather”. That left the Phoenix O-line with no excuses for their first-point turnover and break, which positioned the Thunderbirds with an early lead that they would hold through 10 minutes of play time. However, The Phoenix defense stayed right on their heels, registering 4 blocks on separate points before finally ending the first quarter on a tieing break. This effort was aided by an impressive James Pollard sky, a recent staple of Phoenix defensive highlights. From there it was all Philadelphia, consistently dominating on offense and punching in runs of breaking defense throughout the game. On the flip side of the disc, the Phoenix offense was indomitable, allowing only 3 turnovers and 1 break after the first quarter and scoring flawlessly on 82% of possessions. Their efforts were boosted by impressive performances from Sean Mott (3A, 6G), Mike Arcata (5A, 5G, 1B), and Ethan Fortin (5A, 1G, 1B). 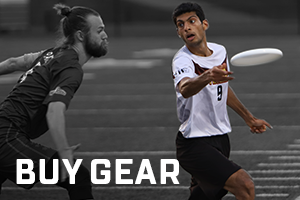 The Phoenix defensive glory was shared amongst many players, most notably the phenomenal young Phoenix defenders James Pollard (1A, 3B) and Igor Smola (2G, 3B), who performed outstandingly in his AUDL debut. The home crowd of 250 attendants left delighted by the 30-21 toppling of the cross-state rival Pittsburgh Thunderbirds, who will have to wait till next season to seek any revenge in a potential Battle of the Birds rematch. With much of their season in the rear view and 2 weeks of respite till the next Phoenix game, we can’t help but look ahead at the Phoenix’s final 4 game stretch and what lies at the end of that road. To some teams its a big taboo to even mention the post season, with lots of hush and skirting surrounding the topic. But one cannot help but notice how tight and exciting a race this year’s East Division presents with 4 teams currently within a 1-win gap of each other. Another unignorable fact is that the Philadelphia Phoenix have played their most spectacular regular season in recent team history. A record of 4-5-1 with very close (1 and 4 point) losses to the league favorite Rush has forced competitors and commentators alike to consider the fact that this is a new Phoenix team, risen from the ashes of several seasons worth of struggle and growth. Saturday’s win over Pittsburgh secured their best regular season record in 5 years and with 4 games left in their schedule, the Phoenix are entirely in control of their own postseason fate. It is important to note a few caveats to any post season predictions from this point. 4 games represent more than 25% of a season still left unplayed. More complicated still, the New York Empire have only played 6 regular season games thus far, more than half of their season and two road trips to Canada still unplayed. Even with a very tight race in the middle of June, much of the season is still undecided and predictions from this point could be considered dicey speculation at best. That being said however, there are some alluring aspects of the East Division spread that compel the mathematician in me to mull potential outcomes and consider the possibilities. There are a vast number of scenarios that could unfold over the many remaining games through the remainder of East Division play. The Phoenix could win out the remainder of their season, outright securing their path toward Championship Weekend. They could also falter and once again see a playoff berth dance beyond their reach. One certainty however, is that the next two contests the Phoenix face bear significantly more weight than almost any game they have played this season. On June 24th, The Phoenix face a frequent Canadian foe in the Montreal Royal, capping a 3-game series which the Phoenix lead 2-0. A win and 3-0 sweep for the Phoenix could serve as a knockout blow to the Royal, currently neck-and-neck with Philly in the tight East Division standings. While nothing is certain from our current vantage, the Royal face a strong New York roster twice between now and their Phoenix matchup, one home, one away on June 23rd, immediately preceding their visit to Philadelphia. A loss to philly on top of defeats from other East competitors could definitively confine Montreal to regular season play. Ties are incredibly rare in AUDL play as game formating requires teams to play a final, “sudden-death” point in the event of equal scores at the end of an overtime. However, due to persistent rain and lightning during their Week 5 meeting, the Phoenix and DC Breeze left with a tie notched to their season records. This means that at the end of the regular season, they cannot be tied with other teams for season record (the tie counts as more than a loss but less than a win, putting them a half-game above or below other teams) except with one another. However, in the event of a standings tie the winner is determined by head-to-head record, which will be determined on June 30th in DC when the two teams play their only other scheduled meeting. With Philly only one game back from DC, a win on their opponent’s turf will not only knock their rivals down a peg in the standings but also secure the tiebreaker in a very tight East Division race. With DC staring down a Canada trip and facing a vengeful Toronto Rush, this game may be the one that philly needs to punch their ticket. If you’re a Philly fan or a Phoenix player, your focus must be razor-sharp on these next two bouts as they seem to hold the keys to any postseason destiny in store for the budding East Division hopefuls.